Waves of bomb attacks and shootings in north of Baghdad have killed at least 82 people, say security and medical officials. Many of those killed were security forces – who appear to have been a prime target. One of the worst-hit places was Taji, a Sunni neighbourhood some 20 km (12 miles) north of Baghdad, where at least 18 people were killed. At least 112 people were wounded on one of the bloodiest days of the year. Deadly car bombings hit Baghdad, and a government building in Sadr city was attacked. 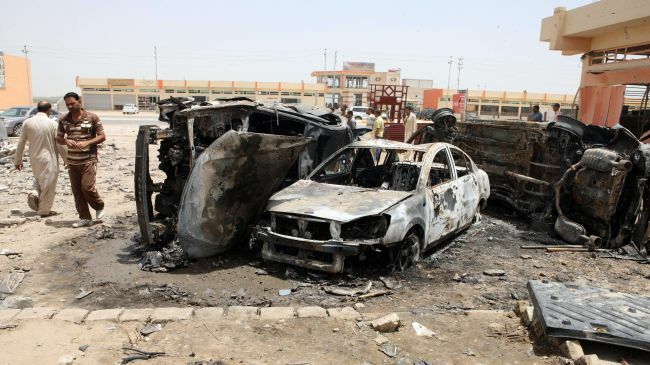 At least seven car bombs hit the northern oil city of Kirkuk. Dhuluiya, Saadiya, Khan Beni-Saad, Tuz Khurmatu and Dibis were also said to have suffered attacks. The security forces suffered badly in Monday’s attacks, with at least 15 Iraqi soldiers killed in a single attack on a base in Salaheddin province. Police checkpoints were hit by car bombs, army bases were struck by mortar fire, and one policeman was even attacked in his home. Those in Taji died in a string of explosions. “What is the guilt of these poor people?” asked resident Ali Hussein. It is the deadliest day in Iraq since 13 June, when another wave of bombings killed 84 people and injured nearly 300. On Sunday bombings south of the capital killed at least 17. Violence dipped in Iraq following the insurgency in 2006 and 2007, but sectarian violence has returned across the country in recent months amid worsening political tensions. At least 237 people were killed during June, making it one of the bloodiest months since US troops withdrew in December.